SUMMER NAMM 2017: Another trade show brings with it another jaw-dropping assortment of guitars from the Fender Custom Shop and, as always, a few surprises, courtesy of the just-announced Mid-Year Limited Collection. Most notable among this month’s cohort is the ‘64 Special’ Strat’s green-on-pink sparkle painted-over finish, the Artisan Thinline Strat’s natural koa body and the undiluted cool of the Twisted Tele’s Bigsby vibrato. But there’s plenty more to drool over, so head on through the gallery for a closer look, and visit Fender Custom Shop for the full details. PRESS RELEASE: A hollowbody Strat that brings a new level of tone, resonance and beauty the Artisan Thinline Koa Strat is crafted from select tone wood and elevates function to the level of form. The thinline body adds warmth and a new dimension of variety to this Strat guitar’s formidable sound. Elusive and mysterious, this Thinline Strat is an instrument that begs exploration and demands a place in your sonic toolbox. Built for the stage, this exciting instrument features a stunning, parchment-bound AAAA koa top over a roasted Okoume body, nitro-finished medium roast AAA birdseye maple neck with ‘63 Strat “C”-shaped profile, 9.5”-12”-radius flat-lam African Blackwood fingerboard, a trio of hand-wound Custom Shop ‘60/’63 single-coil Strat pickups, vintage clay dots, bone nut, 8-hole gold anodized pickguard, Vintage Mod #2 wiring and an American Vintage six-screw synchronized tremolo. 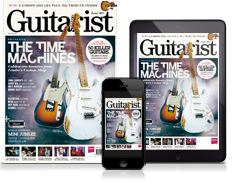 PRESS RELEASE: The Telecaster is a legend for a reason. Its definitive sound has cut across every musical genre. The twang and the feel made the Tele a musical machine that’s been cemented in history by some of the world’s biggest artists. The lightweight Thinline body and Relic ‘floral finishes’ harken back to a time when the Tele became the favored guitar of stage heroes, while giving it an attitude all its own. This guitar also features a stable quartersawn maple neck with ’57-style “Soft V”-shaped profile, 9.5”-radius fingerboard, modern Tele wiring with Greasebucket tone circuit, vintage-correct Tele bridge with brass saddles, handwound Custom Shop Original Blackguard bridge pickup and Texas Special neck pickups, parchment pickguard and vintage-style tuners with the classic Fender logo. Familiar enough to latch on to and cool enough to fall in love with, this Telecaster includes a deluxe hardshell case, strap and Certificate of Authenticity. PRESS RELEASE: Everything you want in a Tele and more, the Limited Edition Journeyman Relic Twisted Tele is one handsome tone machine. The secret to this guitar’s tone is right there in the name; the hand-wound Twisted Tele pickups set the foundation by cranking out hot, high-output Telecaster guitar tone, while the Greasebucket tone control allows you to roll off the highs without losing volume. The Bigsby B-5 bridge and tailpiece add a way-cool retro vibe while the Journeyman Relic finish gives it the look and feel of a guitar that’s seen service on many a stage. Other features include a select two-piece, off-center ash body with lacquer finish, a lacquer-finished rift-sawn maple neck with 10/56 “V”-shaped profile, 9.5”-radius fingerboard, jumbo frets and one-ply parchment pickguard. PRESS RELEASE: A menacing monster, the Relic Black Dual-Mag Strat looks like it’s been played for years on the baddest chicken-wire-enclosed stages while offering all the modern luxuries you expect from a Fender Custom Shop guitar. Dark and daring with sultry black-on-black looks, this beauty brings a booming sound, thanks to the roasted alder body and ultra-stable quartersawn roasted maple neck that gives it a darker look while warming up the tone and making it more resonant. Additional features include a Relic lacquer finish that lets the body breathe with unrestrained tone, flat-lam rosewood fingerboard, Jescar 6100 jumbo frets, 9.5-12”compound-radius fingerboard, ‘60s-style “Oval C”-shaped neck profile, hand-wound Dual-Mag pickups with Vintage White covers, Strat Blender with Greasebucket wiring and a black Relic pickguard. PRESS RELEASE: Stand out from the crowd with the Limited Edition Fender Custom Shop Heavy Relic Strat, a throwback to one of the most exciting times of Stratocaster development. ’59 saw the debut of the rosewood fingerboard, bringing a new look and sound to the Strat. The two-piece,nitro-finished alder body’s Heavy Relic treatment, roasted neck, gold anodized pickguard and Texas Special pickups make this guitar bad, baby, bad—especially when it comes to its looks and sound. Other features include a lacquer-finished quartersawn roasted maple neck with “ ’59 C”-shaped profile, 9.5”-radius flat-lam rosewood fingerboard, 6100 jumbo frets and Vintage Modified #2 wiring. Easy playability, tonal versatility and nostalgic, gorgeous looks make it a want for every player, and a must for every collector. Includes deluxe hardshell case, strap and Certificate of Authenticity. PRESS RELEASE: An absolutely gorgeous guitar, the Limited Edition Relic ’64 Special Stratocaster pops with a unique color-over-color finish. The striking contrast between the two paint colors grants a subtle hint of sparkle that pops when the lights hit it just so. Eye-catching and ear-pleasing, thanks to the hand-wound Custom Shop ’64 single-coil Stratocaster pickups, this tone machine is made for the spotlight. Other sterling features include a hand-selected two-piece alder body with nitrocellulose lacquer finish, AA flame maple neck with ’63 Strat “C”-shaped profile, round-lam maple fingerboard, 6105 frets, Vintage Modified #2 wiring and a three-ply parchment pickguard. 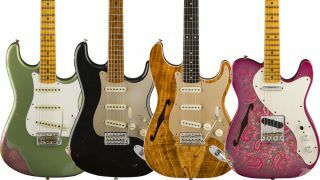 PRESS RELEASE: How hot do you think the Limited Edition Relic ’56 Fat Roasted Strat is going to sound? Its tone is on fire, thanks to roasted maple neck and roasted alder body with Journeyman Relic lacquer finish, matched to hand-wound Fat 60s Strat pickups with Fat 50s wiring as the special sauce. This wiring offers bold tone with transparent bloom while reducing treble loss when adjusting the instrument’s volume. It also smooths the control tapers, avoiding the typical hotspots when adjusting your volume or tone.